One sure-fire way to ensure ASO doesn?t have a change of heart over its decision to exclude Astana from the Tour de France was the creation of the ?Let Levi Ride? campaign. My immediate thought was: ?There?ll be a website, flags, banners, t-shirts and little stickers by the end of the week.? It didn?t even take that long. The reaction from the dome-headed Californian was almost immediate. A website. www.letleviride.com if you must. There?s a shot of Levi in a leather jacket, arms folded, looking all tough and defiant. He?s wearing a little woollen beany hat too because, like me, he knows it?s hard for bald men to be taken all that seriously when they?re angry ? unless they?re Bruce Willis. All that?s missing are pictures of Levi and his dog ? come on, he?s bound to have one ? looking terribly sad. ?It?s Bouncer’s dream to sit in front of the TV this July, dozing, licking his balls and watching his pop win the Tour de France. Don?t do it for me, do it for Bouncer,? he should write. Yes, do it for the dog, that might win support. It worked for Tyler. To demonstrate how unfair it all is, there?s a real quote too. Well, sort of. ?All that?s needed for injustice to prevail is for good people to do nothing,? it says. It?s credited to ?unknown?, perhaps because a google search to discover the origin of the statement threw up a bunch of new questions. Was it Edmund Blake, the 18th Century British politician who said it? Or Churchill? Or maybe Britney Spears? Oh crumbs, just put ?Unknown? cos it?s a cracking quote only we don?t know who said it. If all it takes to right a wrong is bastardise a semi-famous quote you can?t quite place, how about this one? ?The Tour de France is a great sporting event owned by a private company. It is not obliged to suit the wants and needs of individuals. No one ? not even Levi ? has a divine right to ride it. So they don?t want to invite your team. Go do something else then,? ? Unknown. At the time of writing, more than 15,000 people had signed the online petition to ?undo the unjust exclusion of Levi Leipheimer and his team from this year?s Tour de France?. That?ll do it, then. ?BE HEARD? it urges, as if clicking the mouse and brainlessly typing your email address into a little window will change the decision. And another thing. To complement the laziest of thinking there is another unattributed quote. ? ?Astana now spends more money on anti-doping than any other team in the pro peloton? the site claims. Really? Do they? Prove it. Give us some numbers. Let?s spark a ?We spend more than you? fight. Actually, so what? This may be a tough one to grasp, but it?s not about money. Anti-doping isn?t about spending your way to a clean image, it?s about talking the talk and, most importantly, walking the walk. 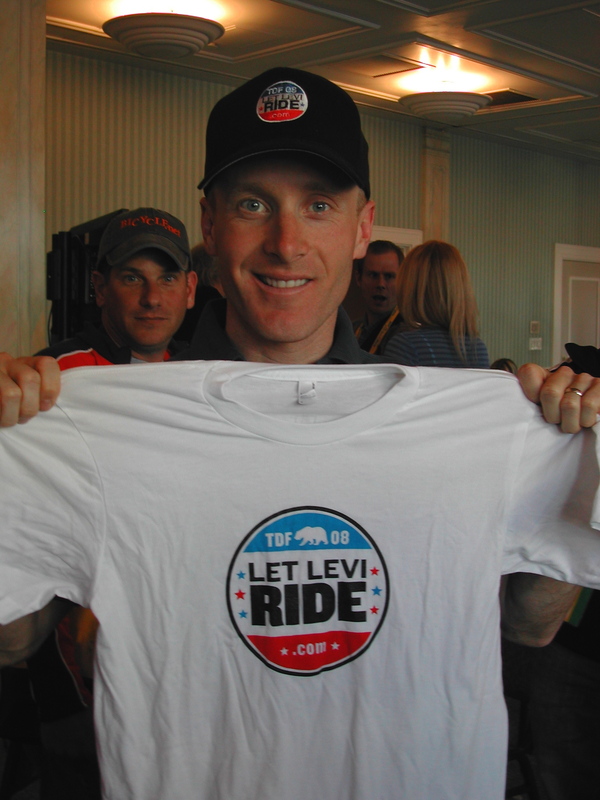 So, tell you what Levi, if riding the Tour de France means so much to you, how about you pledge to turn up at Paris-Nice, Criterium International and Paris-Roubaix and give it your best shot at all of them ? yes, even over the cobbles. Then you can have a place. Go on, show us how much it really means to you. Or is it all just a little bit easier to flog a load of T-shirts and get the slack of mind to sign an online petition ? surely the nadir in the history of protesting about things. Or leave Astana. You’re not barred. Your team is. Ask around. See who else wants to take you. There, problem solved. And in the meantime, have a think about the campaign because given the recent trend of online protests, one could be forgiven for thinking Levi has done something wrong, which he hasn?t. Sport?s current obsession with globalisation ? as demonstrated by the Premier League?s determination to take Wigan Athletic versus Birmingham City to an adoring public in Sydney, Tokyo or Dubai ? isn?t about winning new fans. It?s about money. This is not a sudden realisation, although there were parallels between the language used by football boss Richard Scudamore and cycling?s leader Pat McQuaid but at least we?ll give Pat one thing, at least he?s honest about the fact that taking cycling to previously uncharted territories is actually about tapping into new markets. Apparently the big English clubs now have 90 per cent of their fan base overseas, and it?s only fair that these loyal fans should be treated to the chance to watch their team in the flesh once in a blue moon, rather than have to hop on an aeroplane for ten hours, clear immigration, catch a train to Derby and then find that Pride Park?s all sold out for the afternoon. McQuaid and the man who runs the ProTour, Alain Rumpf, have both outlined the need for cycling to globalise. Neither of them really seem to convey why they must take top-rate cycling to Asia, South America or the Middle East, they just know they must. So given that Astana have been left out of the Tour de France, you?d think that Mr McQuaid would be championing the other races they could ride in July ? such as the Tour of Qinghai Lake in the relatively untapped China ? rather than getting all red-faced about ASO?s snub. Come on, if globalisation really is the ?Next Big Thing? how about encouraging Alberto Contador and Levi Leipheimer to rock up on the Tibetan plateau from the 12th to the 20th of July. After all, Damiano Cunego won it in 2003 and it?s a heck of a line to put on the posters. With a bit of spin the story could be changed to: ?Contador chooses Qinghai Lake over Tour de France.? I?m sure the PR man could get him to say: ?Alberto grew up dreaming of winning a big race in China ? and this fits the bill.? Okay, okay, we?ll lay off Astana for five minutes. Just five, mind. Dave Brailsford won?t thank me for hyping up Britain?s chances of winning even more gold medals at the World Track Championships than they did last year, but I?m going to anyway. Last year they took a mighty seven. Nobody wants to count chickens before they?re hatched, and we should be mindful that this year it?s the Olympics that top the list of priorities. But a World Championship on home soil could provide the added edge to go for eight. Let?s look at the evidence. Victoria Pendleton has gone on record saying she?d like to target all four competitions available to her ? Keirin, sprint, team sprint and 500-metre time trial. So that?s four golds, then. Barring disaster Bradley Wiggins will win the individual pursuit and then slot into a gold-medal winning team pursuit line-up. Chris Hoy is practically unbeatable in the Keirin, could get a bit of luck in the sprint and if he decides to go for the kilometre, he could win that too. Being fair to Chris, we?ll put him down for two of the three. Rebecca Romero proved in Copenhagen she can beat the best in the pursuit and will has another month of honing. And that?s not even counting the men?s team sprinters ? although they are up against a very strong French team ? the debutant women?s team pursuiters, Chris Newton in the points race and the dream team of Wiggins and Mark Cavendish in the Madison. Okay, we?re getting carried away now, but surely it?s enough to make you want to go and watch it for yourself. Tickets for most sessions are still available although Saturday is sold out. See the official website for details. The UCI quietly announced the passing of the Eindhoven Team Time Trial this week. The city of Eindhoven simply didn?t want it anymore and so, after just three years, it is no more. It suffered from being the wrong race at the wrong time in the wrong place. Okay, so Holland could be considered the spiritual home of team time trialling, thanks to the success of the TI-Raleigh squad in the late 1970s. But holding a stand-alone team time trial a fortnight before the Tour de France was never going to work. What was the point? And when the Tour dropped the team time trial, Eindhoven didn?t even have a function as a warm-up event. Having said that, we did have a great day a couple of years ago when a team of time trial nuts comprising our former sub-editor Simon Smythe and his Ciclos Uno team-mates tackled the same course on closed roads later that afternoon. They did pretty well, too, finishing in a time of 1-03-36 ? a mere 11 minutes slower than CSC.
? Gerolsteiner won in 2005, CSC won in 2006 and 2007.